As it is rainy season in Goa, I remembered my mom’s canned sardines recipe called Sardinhas a Portuguesa (Sardinhas em Molho de Tomate) that she would make. Growing up we ate fish that was seasonal as we had no other options. Goan’s did not import foods as they do now a days. Our exposure to other cuisines was very limited. It was only when friends and family visited from outside Goa or India we got a chance to taste other foods. Usually in July-August sardines were available and at least once’s a year my mom cooked her Sardinhas (Portuguese). 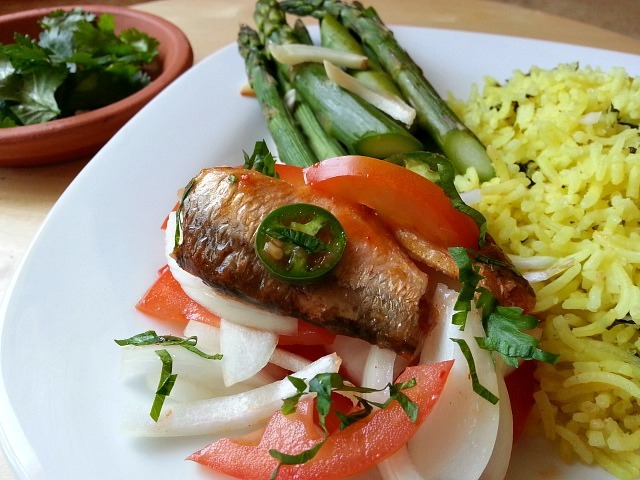 She would also make sautéed sardines with tangy and sweet recheado masala, curry and crispy fried sardines coated either with rava(cream of wheat ) or rice flour, salt and turmeric. This recipe is also made in Goa with Fire Roasted Sundried Salted Mackerels (“Karem” in Konkani). Since I am not that privileged with easy access to fresh sardines in LA, I do use the canned one’s along with canned tuna to make this salad. My kids enjoy it with tortilla chips and I like it as a side with my rice and fish curry or Goan Pulao. As kids we called it “Mama Arroz” as it was cooked by my mom on Sundays which was her day off. Another recipe of the canned sardines we made was a smooth paste with room temperature butter. We would make sandwiches or spread it on Ritz Crakers as appetizers for birthday parties. Drain the fish out of the sauce. 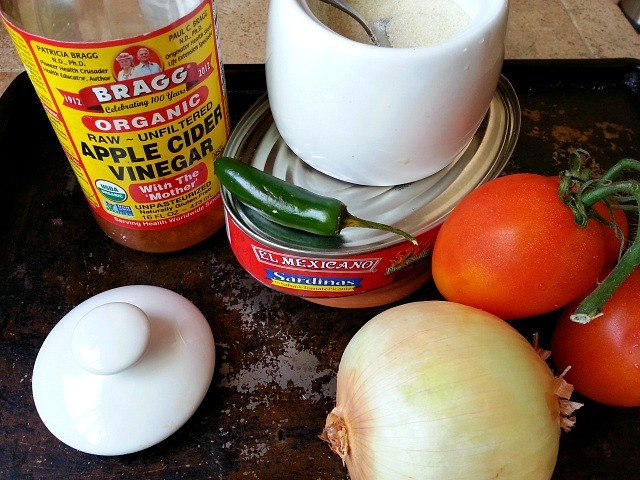 Add all the chopped ingredients along with vinegar and salt in a bowl and mix well. Finally crumble the fish and add to the mixture. Mix gently as not to break it up too much. Chill in the refrigerator till ready to serve. 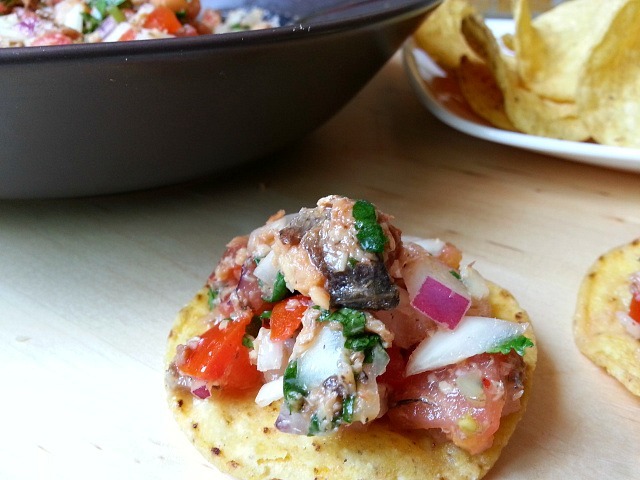 Enjoy it as a side along with rice or as a canned fish salsa with tortilla chips which my kids enjoy. 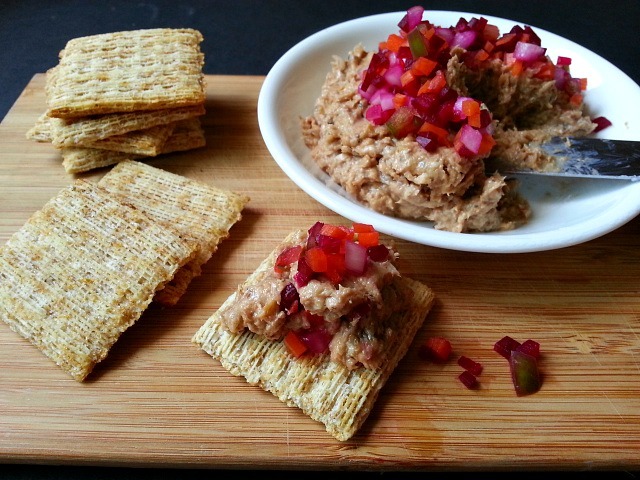 Here is the Sardine Butter Paste Recipe made for parties with 1 can of drained out sardines mashed with 3-4 tbsp of room temperature butter and then topped with quickly pickled crispy fresh veggies like beets, bell-peppers and sweet white onions. I have topped it on a Triscuit. We also made sandwiches with the sardine paste. 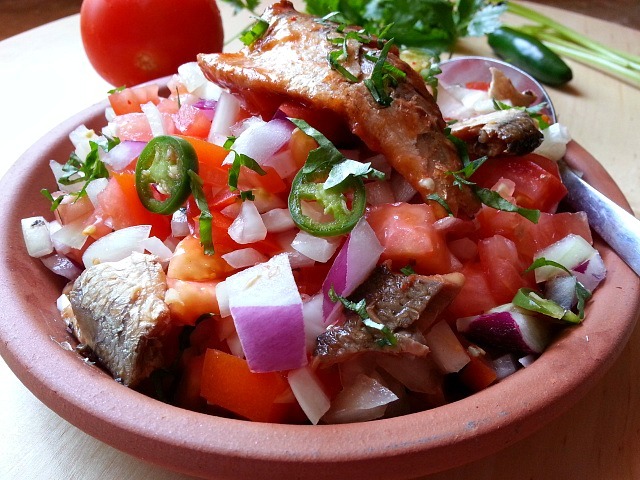 Oh my have to try these sardines recipes! I would encourage you as along as you do not mind the fishy smell. That looks simple and effective. Hmm, if only the fish that I had as a kid was like this. I love sardines cooked in a whole range of ways, from grilled ones served at a beach hut in Portugal to Portuguese fish paste on their lovely sourdough bread toasted to tinned sardines in tomato sauce, mashed on toast with a splash of vinegar and put under the grill. So I would love to try out your recipe! Thank you so much for your kind words and for sharing my work. I appreciate it very much. My uncle used to live in East Timor Dili for 50 plus year till he passed away in early 2000. I never been there Nandini….I am so close to your uncle in location…..probably a lot of thing has done by your uncle….. He was a missionary priest and very involved with the community. I only have a few pictures of him. Hopefully one day I will get a chance to visit and see all of his work. Yes they are and so versatile. I only wish I could get them fresh. Malaysia was briefly invaded by Portuguese (or Portugis in Malay) in 1500s, but for food assimilation to happen and remain for so long…that’s really interesting! Hi ! The first picture got my attention and made me hungry. I like the rest too as I’m a lover of sardines. The simple is often the best ! This is also a comfort food from when I was a child. My mom would make a sauce with shoyu (soy sauce), apple cider vinegar, chopped onions, and minced garlic. Then she would have steamed rice, the sardines in tomato sauce, and cherry tomatoes cut in half. It was simple meal, but those are the meals that fond memories are made of. Nandini, your post brings back memories of my childhood days. Salted mackerel and sardines were common in our household. Thank You Much Mihrank for your kind words. Great idea. We don’t get fresh sardines in the high desert, but canned sardines are plentiful. Growing up we always had canned sardines, and sometimes canned salmon. I still eat sardines, not so much the canned salmon, I prefer fresh. Thanks for showing us what you can do with the canned sardines. That is so good to know Van. They do taste equally good just out of the can. I had my first taste of Herring recently on a trip to a Danish village called Solvang out her in California. AGOSTO DESGOSTO. Not really, Your CANNED SARDINE SALAD looks STARTLING. What a start to the month of AUGUST. Me late mum would do a lot of dishes with sardines, as they were readily available in abundance in the month of august. She used to call them TALLE. In Spain they barbecue the sardines by the seaside. You can buy 10 or 15 sardines for 2euros. Your sardine salad is HEAVENLY. And Your photos make it look amazing. I think the salads complement the sardines. As Goans are fish eaters, this dish will be every Goan’s dream. I could go on and on and on about this fab dish. By the way it is GOA DAY tomorrow in the U.K There will be a lot of food and music at the venue. Goan Sausages, sorpotel,bebinca,doce, prawn balcao and so on. There will be some NUTCASES drinking like mad. Have a BRILLIANT WEEKEND. Thank You Mr Stan for your kind words. It was hard to decide how I wanted to style the pictures because when you mix the sardines into the salad it does get messy and I wanted the images to be appetizing. Yes it is “Talle” time in Goa. I was talking to my mom and she was saying that they now get it in July since they import the fish from Karnataka and other states. I know sardines are very popular in Spain and grilling them with some salt and little oil is delicious. Looks like tomorrow will be a good day for you with all the good Goan foods 🙂 .Have a great time and regards to Mrs Stan and yourself. I love your pictures! Mine are very amateur. Great summer recipe too. Thank You so much Amanda. It is very kind of you to say. You do have beautifully plated food pictures as well 🙂 You have a great weekend. Oh lovely! I never thought a sardine dish could look sooo good.. definitely will try as soon as I can get my hands on the ingredients.. wonderful indeed! This is great post. My wife is Portuguese and naturally loves Sardinhas. I’m not a fan and always tease her as to how she eats them.. 😃. I just showed her your post.. Guess what will be made very soon. Lol.. Thank You so much. I am happy to know your wife approved my recipe specially since she is Portuguese 🙂 Do let me know her feedback when she makes it. Will do! Have a great weekend.. Boa Noite! 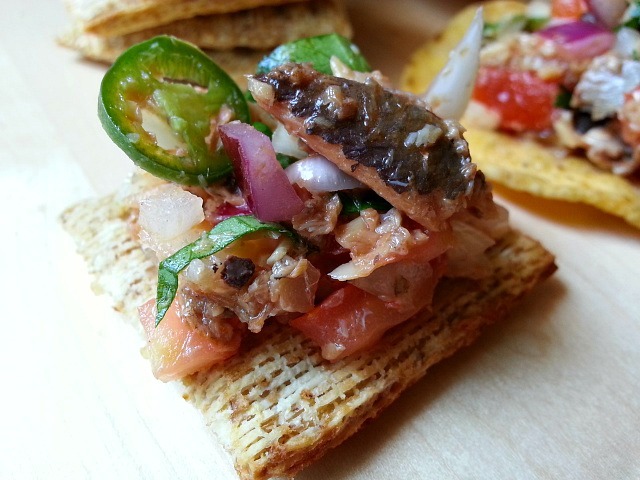 I grew up on sardines but we just put them on crackers. I like your recipe. Thank You so much DMarie. I am happy to know you like what you see 🙂 You have a great weekend.